eMiller School of Medicine (V.K. ), University of Miami, Miami, Florida. BACKGROUND AND PURPOSE: Traumatic peripheral nerve injury is common and results in loss of function and/or neuropathic pain. MR neurography is a well-established technique for evaluating peripheral nerve anatomy and pathology. However, the Gd-DTPA enhancement characteristics of acutely injured peripheral nerves have not been fully examined. This study was performed to determine whether acutely crushed rat sciatic nerves demonstrate Gd-DTPA enhancement and, if so, to evaluate whether enhancement is affected by crush severity. MATERIALS AND METHODS: In 26 rats, the sciatic nerve was crushed with either surgical forceps (6- to 20-N compressive force) or a microvascular/microaneurysm clip (0.1–0.6 N). Animals were longitudinally imaged at 4.7T for up to 30 days after injury. T1WI, T2WI, and T1WI with Gd-DTPA were performed. RESULTS: Forceps crush injury caused robust enhancement between days 3 and 21, while clip crush injury resulted in minimal-to-no enhancement. Enhancement after forceps injury peaked at 7 days and was seen a few millimeters proximal to, in the region of, and several centimeters distal to the site of crush injury. Enhancement after forceps injury was statistically significant compared with clip injury between days 3 and 7 (P < .04). CONCLUSIONS: Gd-DTPA enhancement of peripheral nerves may only occur above a certain crush-severity threshold. This phenomenon may explain the intermittent observation of Gd-DTPA enhancement of peripheral nerves after traumatic injury. The observation of enhancement may be useful in judging the severity of injury after nerve trauma. Peripheral nerve injury has been classified by Sunderland6 on the basis of damage to Schwann cells/myelin, axons, endoneurium, perineurium, and epineurium (grades 1–5, respectively). Nerve conduction studies and electromyography are the standard diagnostic tests for grading traumatic mononeuropathy.7 However, electrodiagnostics have limited ability to distinguish Sunderland grade 2, 3, and 4 injuries in the acute and subacute settings.8 Because skeletal muscles begin to atrophy immediately after denervation and are permanently wasted by 18–24 months, and because axons regenerate at only millimeters per day, there is a clinical need to accurately grade nerve injuries in the acute setting so that surgical intervention can be expedited (when appropriate) to prevent permanent loss of function.9 In addition, there is a clinical and scientific need for noninvasive diagnostic testing to monitor the effects of various novel medical and surgical interventions on nerve repair.10,11 Diffusion tensor imaging has shown great promise in this realm in recent years12 but remains a primarily experimental technique and is technically challenging. Although Gd-DTPA is widely available with a well-defined safety profile, the Gd-DTPA enhancement characteristics of acutely injured peripheral nerves have not yet been fully examined. We performed this study to determine whether acutely crushed rat sciatic nerves demonstrate Gd-DTPA enhancement and, if so, to evaluate whether enhancement is affected by crush severity. On the basis of prior literature, we hypothesized that crushed nerves would not show Gd-DTPA enhancement. This study was approved by the University Animal Care and Use Committee (Protocol No. 06–172). Twenty-six male Sprague-Dawley rats were used for the study. In each rat, the left sciatic nerve was surgically exposed and crushed at the level of the midfemur by using either surgical forceps (n = 14) or a microvascular/microaneurysm clip (n = 12). Forceps used for the study included the #5 jeweler and toothed Adson, which were supplied by Fine Science Tools, Foster City, California. All forceps injuries were delivered for 60 seconds at maximum intensity, with the handles of the forceps completely opposed. Adson forceps injuries were delivered immediately adjacent to the forceps teeth, using the flat surface of the instrument. Forceps crush intensity was estimated in grams by using a 3-mm force-sensitive resistor (FlexiForce A101; Tekscan, South Boston, Massachusetts), a multimeter, and a set of scale calibration weights. The microvascular/microaneurysm clips (Harvard Apparatus, Holliston, Massachusetts) used for the study included 10- to 15-g microvascular (n = 6), 20- to 30-g microvascular (n = 3), and 60-g microaneurysm (n = 3) clips. Clip crush durations included 6 seconds (n = 3), 60 seconds (n = 6), and 600 seconds (n = 3). Sham surgery was performed on the right sciatic nerve in 4 animals; nonoperative right sciatic nerves in the remaining animals served as internal controls. MR imaging was performed on a 4.7T dedicated animal magnet (47/40USR; Bruker Biospin, Ettlingen, Germany) using a 400-mT/m gradient coil with an inner diameter of 12 cm and a quadrature birdcage radiofrequency coil with an inner diameter of 7.2 cm. Animals were imaged between postoperative days 0 and 30; 50 MR imaging sessions were performed (Tables 1 and 2). Sequences included axial T1-weighted gradient-echo with fat saturation (TR, 235 ms; TE, 2.6 ms), axial T2-weighted rapid acquisition relaxation excitement with fat saturation (TR, 2500 ms; TE, 23 ms), and axial T1-weighted gradient-echo with fat saturation immediately after 0.1 mmol/kg of intravenous Gd-DTPA (Magnevist; Bayer HealthCare Pharmaceuticals, Wayne, New Jersey). 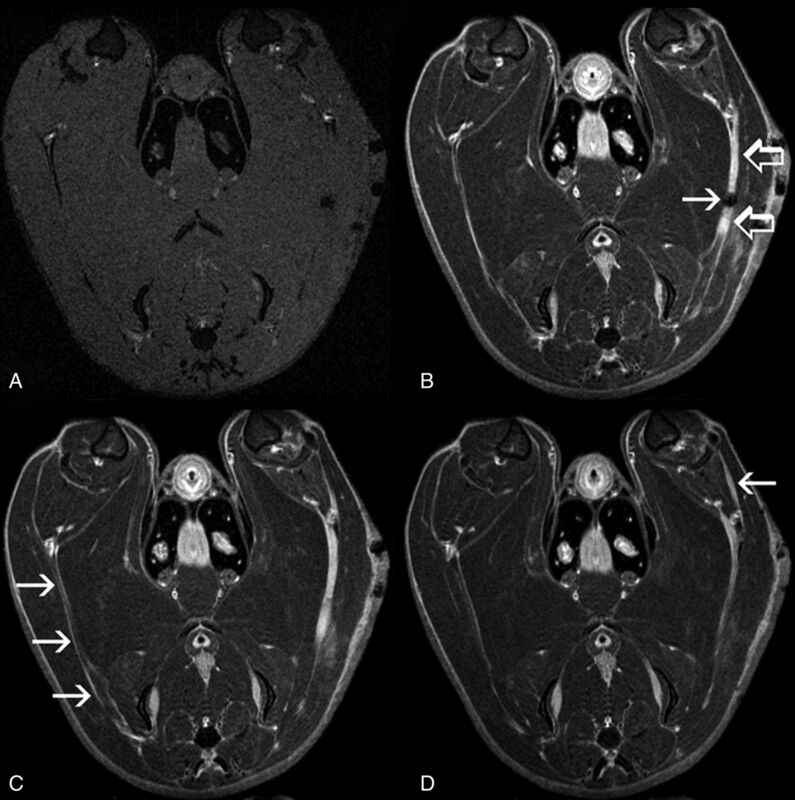 Limited dynamic contrast-enhanced (DCE) T1-weighted gradient-echo imaging with fat saturation was performed on select animals, using the Bruker Small Animal MRI and Spectroscopy sequence (TR, 35 ms; TE, 3.5 ms). Sixteen MR imaging sessions included limited DCE imaging. All acquisitions had a section thickness of 0.8 mm without a gap, an FOV of 5 × 5 cm, and a matrix size of either 168 × 168 or 256 × 256. Gd-DTPA was administered through a surgically placed external jugular central venous catheter. Animals were sedated with isoflurane during imaging and positioned in the prone (normal upright) position, with hips and knees flexed at roughly 90°. Images were acquired in the axial plane, a few millimeters posterior to and roughly parallel to the femurs. Image postprocessing included manual ROI selection and calculation of the signal-to-noise ratio in each ROI. ROIs included the injured sciatic nerve in the region of the crush injury, sham/nonoperative nerves in the corresponding contralateral location, normal muscle, and background air (Fig 1). The SNR was calculated as the quotient of the mean ROI signal divided by the SD of the noise of background air. Enhancement was calculated as the percentage increase in the SNR after the administration of contrast. Statistical analysis included comparison of enhancement after forceps injury with enhancement of clip injured nerves, sham nerves, nonoperative nerves, and normal muscle using a 2-tailed, 2-sample Student t test. As an internal control, enhancement of sham nerves was compared with enhancement of nonoperative nerves using the same statistical methodology. Significance was set at P < .05. Axial T1WI with fat saturation after Gd-DTPA. 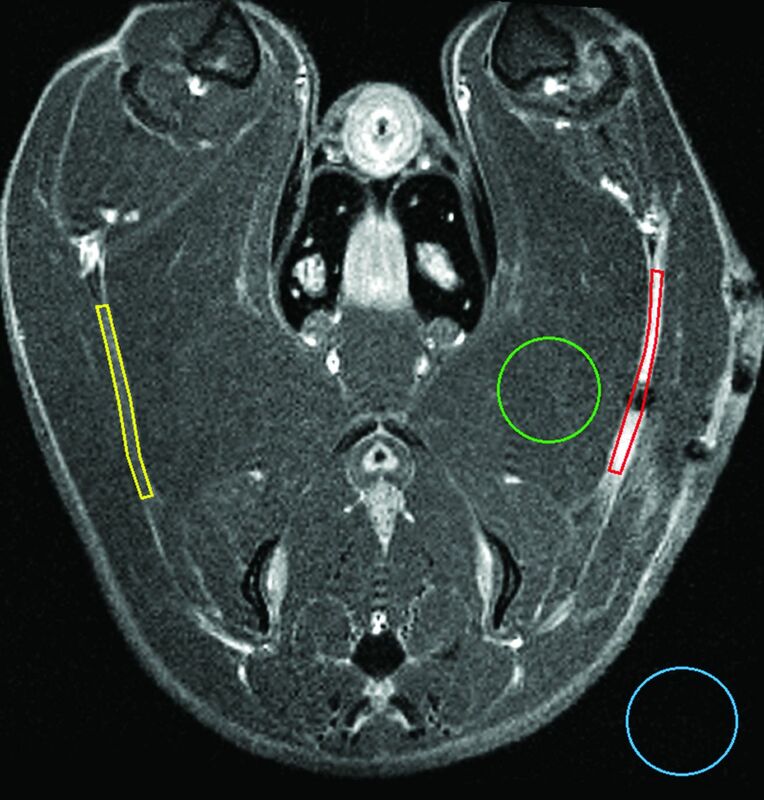 Areas outlined in color represent manually defined ROIs corresponding to injured nerve (red), contralateral nerve (yellow), muscle (green), and background/air (blue). Precontrast and nonenhancing nerves were localized by correlating T1WI and T2WI findings. Measurements of the compressive force delivered by the #5 Jeweler forceps ranged between 650 and 750 g (6.4–7.4 N). Measurements of the compressive force delivered by the Toothed Adson forceps ranged between 750 g and 2.0 kg (7.4–20 N). On T2WI, 14 of 14 (100%) forceps-injured nerves demonstrated increased caliber and signal proximal to, in the region of, and distal to the site of injury (Fig 2). Increased T2 signal extended proximally as far as the sciatic notch and distally well into the tibial and peroneal nerve branches. In contrast, only 8 of 12 (67%) clip injured nerves demonstrated qualitative signal hyperintensity on T2WI. Axial T2WI with fat saturation (#5 Jeweler forceps injury, day 13). A, Injured sciatic nerve (arrows) shows increased caliber and signal compared with the nonoperative contralateral nerve. A small focus of susceptibility artifact (open arrow) is seen at the site of injury, presumably representing blood products. B, The adjacent section shows T2 hyperintensity in a distal branch (arrow) of the injured sciatic nerve. Qualitatively, 14 of 14 (100%) forceps-injured nerves demonstrated avid Gd-DTPA enhancement on T1WI. Enhancement was seen a few millimeters proximal to, in the region of, and several centimeters distal to the site of crush injury (Fig 3). Like T2 signal hyperintensity, Gd-DTPA enhancement extended distally into the tibial and peroneal nerve branches. However, Gd-DTPA enhancement did not extend as far proximally (toward the sciatic notch) as T2 signal hyperintensity. Robust Gd-DTPA enhancement was observed in forceps-injured nerves as early as 3 days after injury. Enhancement peaked at 7 days and subsequently diminished, but it was still evident on day 21 (Fig 4). 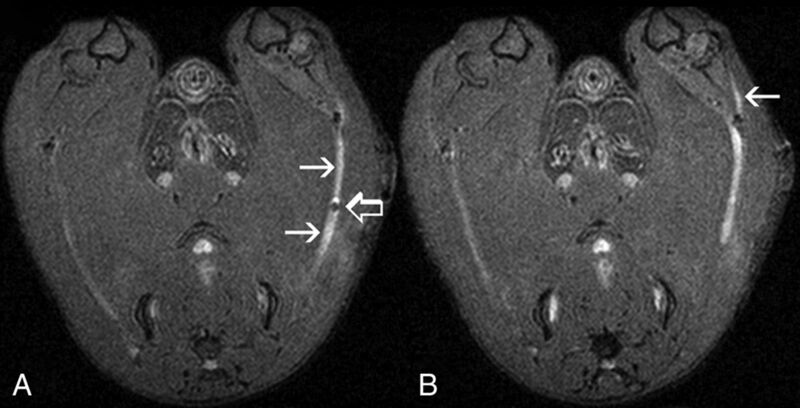 Axial T1WI with fat saturation, pre- (A) and post- (B–D) Gd-DTPA (same animal as in Fig 2). A, On precontrast images, both injured and nonoperative nerves are isointense to muscle. B, Intense Gd-DTPA enhancement (open arrows) is demonstrated a few millimeters proximal to, in the region of, and distal to the site of crush injury (arrow) (On-line Video 1). C, The nonoperative contralateral nerve (arrows) is well seen in this section and demonstrates a thin rim of peripheral enhancement but no internal enhancement (On-line Video 2). D, Enhancement is seen in a distal branch (arrow) of the injured sciatic nerve (On-line Video 3). Axial T1WI pre- (left) and post- (right) Gd-DTPA with fat saturation acquired at days 7 (A and B), 13 (C and D), and 21 (E and F) after severe (forceps) crush injury. Robust enhancement of injured nerves is seen at all 3 time points (arrows). Quantitatively, enhancement of forceps-injured nerves was statistically significant (P < .05) compared with normal muscle at days 3, 7, and 14 (Fig 5). Enhancement of forceps-injured nerves was statistically significant compared with sham nerves (P < .02) as well as nonoperative nerves (P < .01) on day 7 only. 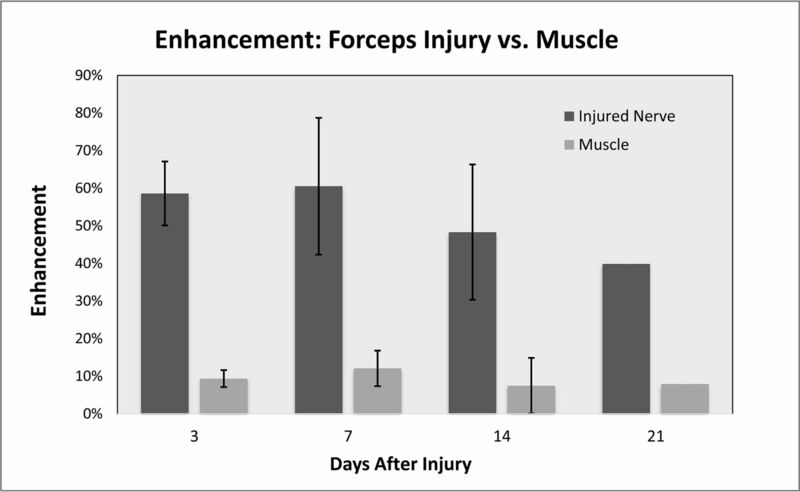 Peak enhancement after severe (forceps) crush injury compared with normal muscle between days 3 and 21. Enhancement is expressed as the percentage increase of the signal-to-noise ratio after Gd-DTPA administration. Error bars represent 1 SD. In contrast, only 1 of 12 (8%) clip-injured nerves demonstrated Gd-DTPA enhancement on T1WI. This nerve had been crushed with a 60-g microaneurysm clip for 60 seconds and showed Gd-DTPA enhancement only at the crush site on postoperative days 5 and 7. No qualitative enhancement was seen in the sciatic nerve distal to the crush site or the tibial or peroneal nerve branches. 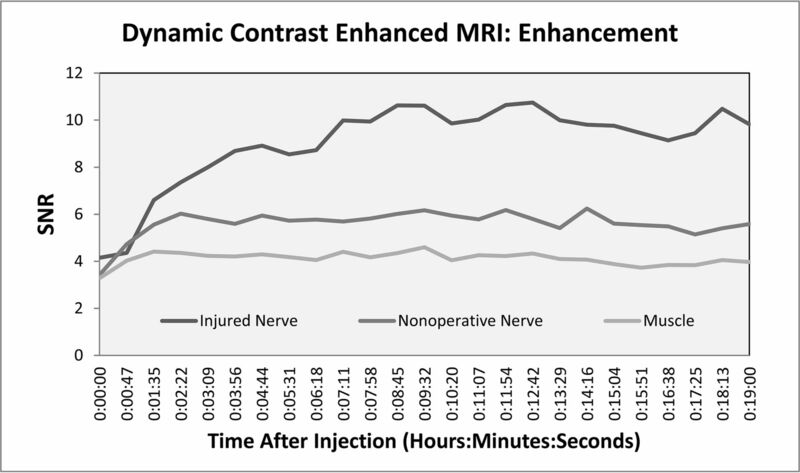 Quantitative enhancement of clip-injured nerves was significantly different from that of forceps-injured nerves when comparing all MR imaging sessions between days 3 and 7 (P < .04). Forceps-injured nerves enhanced both internally and peripherally. Nonoperative nerves did not demonstrate internal Gd-DTPA enhancement. They did, however, demonstrate a thin rim of peripheral enhancement, presumably representing mesoneurium and/or external epineurium, both of which lack a blood-nerve barrier (BNB) (Fig 3C). Some sham nerves demonstrated faint qualitative enhancement only at the surgical site on days 7 (n = 3) and 14 (n = 1), though this was not statistically significant compared with nonoperative nerves at the same time points (P > .15). ROI signal-to-noise ratio as a function of time after the intravenous administration of Gd-DTPA (same animal as in Figs 2, 3, and 6). The half-life of Gd-DTPA enhancement was approximately 1 hour after severe (forceps) crush injury. Our results demonstrate that Gd-DTPA peripheral nerve enhancement after severe (forceps) crush injury is a robust phenomenon in the rat sciatic nerve at 4.7T. The relative absence of enhancement after mild (clip) crush injury suggests the presence of a crush-severity threshold, below which enhancement is not observed. Therefore, the observation of enhancement after nerve trauma could potentially be useful in judging the severity of injury. In addition, when one performs MR neurography for peripheral neuropathy of uncertain origin, the observation of enhancement may not exclude trauma from the differential diagnosis. In our study, Gd-DTPA enhancement was more specific for higher grade injury compared with T2 hyperintensity. Also, Gd-DTPA enhancement more clearly localized the site of injury because T2 hyperintensity extended proximally to the sciatic notch, while Gd-DTPA enhancement extended only a few millimeters proximal to the site of the nerve crush. Gd-DTPA enhancement may provide additional information when added to routine MR neurography protocols in the posttraumatic setting. Physiologically, peripheral nerve enhancement is a function of increased blood-nerve barrier permeability.14 The BNB comprises tight junctions between endoneurial endothelial cells and perineurial myofibroblasts.15 Increased BNB permeability can occur with demyelination (neurapraxia), Wallerian degeneration (axonotmesis), high-grade nerve trauma (neurotmesis), and numerous other causes of nerve injury.16,17 In a rat sciatic model, Omura et al18 observed increased BNB permeability 3 days after crush injury, with maximal BNB permeability after 7 days. Increased BNB permeability was observed 5 mm proximal to the site of injury, at the site of injury, and in the entire nerve distal to the site of injury. In a mouse sciatic model, Seitz et al19 observed maximal BNB permeability distal to the site of injury 8 days after crush injury. These histologic results closely mirror our present imaging findings. Nerve crush is considered a model of axonotmesis (Sunderland grade 2 injury) with Wallerian degeneration followed by axonal regeneration.20 Histologic studies have demonstrated a correlation between BNB permeability and axonal degeneration/regeneration.16,18,19 By comparing histologic analysis of tight junction proteins with neurofilaments, Omura et al18 demonstrated that both restoration of the BNB and axonal regeneration occur from proximal to distal and are closely related in time and space. Bouldin et al16 have shown that increased BNB permeability persists beyond 14 weeks after complete transection as well as ricin injury; both models have no axonal regeneration. Further studies may be appropriate to determine whether resolution of enhancement after peripheral nerve trauma could be an indicator of axonal regeneration and whether the persistence of enhancement could indicate the absence of axonal regeneration. Prior studies of Gd-DTPA-enhanced MR neurography after traumatic nerve injury have demonstrated mixed results. Gadolinium-DTPA enhancement has been reported in the facial nerve after crush injury21 as well as in the median nerve after crush injury in an ex vivo model.14 However, Aagaard et al22 performed Gd-DTPA-enhanced MR neurography on 6 rats after sciatic nerve crush, and they were not able to reliably distinguish normal from crushed nerves. Furthermore, Bendszus et al23 reported no Gd-DTPA enhancement of the rat sciatic nerve after ligation injury. Subsequent studies have also failed to demonstrate reliable Gd-DTPA enhancement in experimental autoimmune neuritis, focal demyelination induced by lysolecithin, and experimental Charcot–Marie-Tooth disease.24⇓–26 Our present observations of enhancement very closely parallel prior imaging findings after crush injury, using the nerve-specific contrast agent gadofluorine-M.27 Possible explanations for prior mixed results with Gd-DTPA include varying injury mechanisms, crush forces, crush durations, magnetic field strengths (4.7T versus 1.5T), and MR imaging protocols. The interplay between crush force and crush duration is an obvious target for future investigation of the crush-severity enhancement threshold. In recent years, diffusion tensor imaging has emerged as a potential new technique for evaluating injured nerves for evidence of axonal regeneration.28⇓⇓⇓–32 The loss and restoration of fractional anisotropy has been correlated with histologic and functional degeneration and recovery. Corresponding observations have been made regarding radial and axial diffusivity. However, incorporating DTI into clinical MR neurography protocols may be challenging due to the technical limitations of the technique and the relatively small size of peripheral nerves compared with CNS tissues that are typically investigated with DTI. Further studies may be appropriate to determine whether Gd-DTPA-enhanced MR neurography could supplement DTI, especially when also incorporating DCE.33 Quantitative assessment of the resolution of enhancement could be particularly useful when monitoring mixed lesions (different grades of injury in different fascicles/segments of the same nerve) and subtle responses to medical intervention. This study has multiple limitations, most notably the lack of histologic and functional correlation. Although prior histologic studies have been rigorous, the correlation between BNB permeability and MR imaging enhancement is not necessarily linear. Further studies correlating enhancement with BNB permeability and axonal degeneration/regeneration should be performed to confirm the viability of this technique and to correlate the crush-severity threshold with the Sunderland classification of injury. Further studies should also evaluate the correlation between Gd-DTPA enhancement and functional deficits/recovery. Without functional correlation, it is impossible to ascertain whether nerve enhancement correlates with less favorable prognosis or whether the resolution of enhancement may herald eventual functional recovery. This study has limited statistical power due to several experimental groups, some with small sample sizes. In addition, not every animal was imaged at every time point, and the number of MR imaging sessions per animal was limited. Although a larger experiment would have provided greater statistical power, the lack of clarity in the literature concerning the existence of Gd-DTPA enhancement and its temporal characteristics dictated the need for several experimental groups. We believe that our observation of statistically significant P values, despite these limitations, highlights the robust nature of Gd-DTPA enhancement after severe crush injury. The mechanisms of injury used in this study, though reproducible and established in the literature, are only an approximation of human injuries encountered in clinical practice. However, the use of multiple injury severities more closely mimics a real-life clinical scenario, where injuries are highly variable from patient to patient. Because the exact severity and location of a human peripheral nerve crush injury are rarely known, it could be impossible to discover a crush severity threshold in humans and to correlate the spatial distribution of imaging findings with the precise location of injury. Future clinical studies will be necessary to determine the usefulness of this imaging technique in clinical practice. 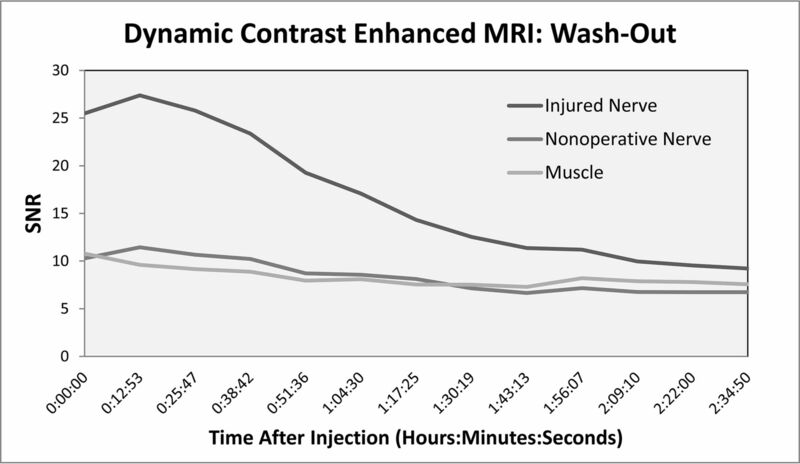 Although qualitative DCE data were collected primarily to examine the kinetics of enhancement after contrast injection, our study was limited by the lack of formal DCE modeling. Future studies may seek to include formal DCE modeling, possibly using the reference region mathematic model,33 given the potential scarcity of reliable arterial input functions surrounding peripheral nerve anatomy. Finally, potential errors in ROI selection may have influenced quantitative and/or statistical results in our study such as the following: scan obliquity, animal motion, difficulty distinguishing nonenhancing nerve tissue from adjacent muscle, partial volume averaging related to mesoneurial and/or external epineurial enhancement, and the presence of increased enhancement in the operative bed regardless of whether nerves were crushed. Errors in nerve contouring potentially could lead to false-positive results when comparing crushed and sham nerves with nonoperative nerves and normal muscle. In our study, forceps crush injury (6- to 20-N compressive force) to the rat sciatic nerve caused robust Gd-DTPA enhancement between days 3 and 21, while clip crush injury (0.1–0.6 N) resulted in minimal-to-no enhancement. Enhancement after forceps injury peaked at 7 days and was seen a few millimeters proximal to, in the region of, and several centimeters distal to the site of nerve crush. Compared with T2 signal hyperintensity, Gd-DTPA enhancement was more specific for higher grade injury and more clearly localized the site of injury. The spatial and temporal characteristics of Gd-DTPA enhancement in our study closely mirror prior histologic studies of blood-nerve barrier permeability after nerve injury. Further studies are needed to determine the scientific and clinical usefulness of this imaging technique. We thank Ramon German, Miguel Martinez, Paulo Diaz, Rosemarie Abril, and Monica Stagg for their hard work caring for the animals and assisting with surgery and Laura Blakemore, MD, and Paul Trombley, PhD, for their critical review of the manuscript. Brook J. Hill and Kyle R. Padgett contributed equally to this work.
. T1-weighted DCE imaging concepts: modelling, acquisition and analysis. 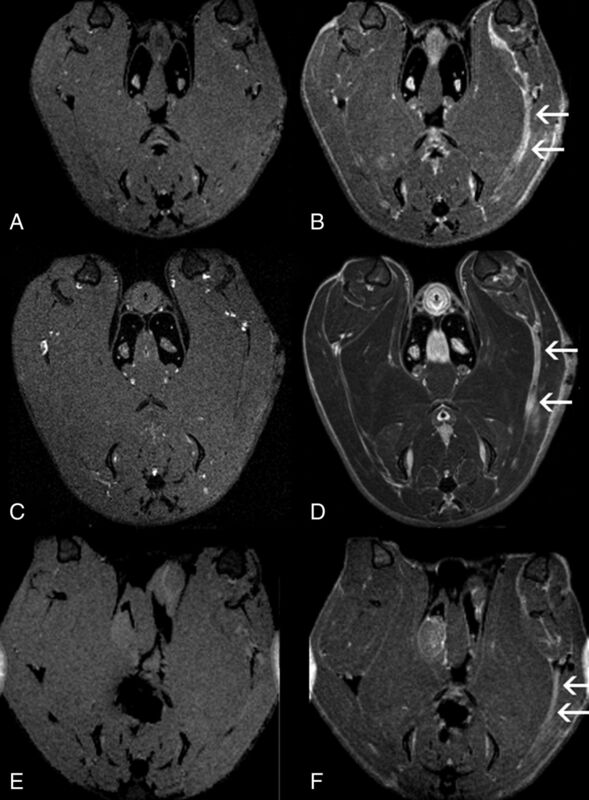 http://www.paul-tofts-phd.org.uk/DCE-MRI_siemens.pdf. Accessed May 30, 2017. Accepted after revision August 24, 2017.